When Jay T. Jorgensen (BA ’94, JD ’97) was preparing to introduce his 2-year-old daughter to U.S. Supreme Court chief justice William Rehnquist in 1999, he taught her to say, “Hello, Chief!” However, when the introduction finally came, she went right up to Rehnquist, said, “Hi-o, Cheese!” and punched him in the knee. Jorgensen is just one of 13 J. Reuben Clark Law School alumni who have clerked at the Supreme Court—a remarkable number considering the school’s young age and ranking. The clerks’ relationship with the justices taught them as much about handling disagreements and working with others as about the law. “An ethos develops that determines how we ought to interact with each other,” explains BYU president Kevin J Worthen (BA ’79, JD ’82), who clerked for Justice Byron White. These alumni all have rich memories of working with the justices, who served as mentors, taught them constitutional law, and demonstrated how to respectfully discuss divisive issues. Although battles over the nomination of new justices and the court’s decisions highlight the lack of civility in political conversations, behind the curtains of the Supreme Court the clerks experience the friendship, respect, and humanity of the justices. The U.S. Supreme Court relies heavily on clerks to handle its caseload. 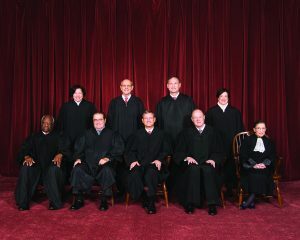 This picture was taken before the death of Justice Antonin Scalia (first row, second from left). Courtesy Supreme Court of the United States. Monte N. Stewart (BA ’73, JD ’76), who graduated from the law school’s first class, was the first Supreme Court clerk from BYU. “The only way someone from an unaccredited, unknown law school in the Great Basin gets a clerkship is through the intervention of heaven,” he says. But his work was good enough that the following year, another clerk was hired from BYU. From then, a tradition was established. There were many tense nights for Michael W. Mosman (JD ’84), now chief judge of the Federal District of Oregon, because emergency requests for stays in executions would come late. Justice Lewis Powell would have to make a decision by 11:30 p.m. to stop an execution scheduled at midnight. One night in particular, Mosman remembers his wife was home with their three children and not feeling well. Powell offered to hire a home nurse to take care of Mosman’s family during the late night. “Little touches like that let me know that he had my best interest in mind,” he recalls. Robert N. Stander (BS ’06, JD ’11), a clerk for Justice Clarence Thomas during 2014, credits mentors like Utah Supreme Court justice Thomas R. Lee (BA ’88), himself a former Thomas clerk. “Justice Lee was instrumental in teaching me the law and setting me on my path,” he says. Now Stander is part of the “Thomas Clerk Family,” a tight group of former clerks. “Justice Thomas had many events for his clerks. He made a lot of effort to spend time with his clerks and get to know them. Justice Thomas is a great man and one of the best role models and bosses I have ever had,” says Stander. 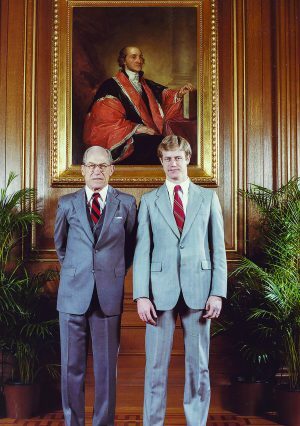 Kevin J Worthen clerked for Justice Byron White, an athlete-scholar and renaissance man who taught his clerks about much more than just the law. Courtesy Kevin J Worthen. Her clerkship with Thomas was not Smith’s only SCOTUS experience. Before that, she had clerked for Judge Samuel Alito on the Third Circuit Court of Appeals with her husband, John M. (JD ’01), possibly the first husband-wife duo to clerk together. When Alito joined the court during the 2005 term, he brought Smith with him for a second Supreme Court clerkship. During Alito’s confirmation, an “army of clerks,” as described by Smith, emerged to stand by him, including Smith and Moore. “I often did not recognize the person that the media was portraying Justice Alito to be,” Moore says. In turn, both Smith and Moore conducted interviews to tell America about the Alito they knew. The former clerks call the experience an education in the law beyond what a law school can provide. Mosman’s clerkship with Powell introduced him to jurisprudence and political philosophy. “There is a contest of ideas and philosophies about the law that occurs at the Supreme Court. It requires you to think deeply about the nature of law,” Mosman says. These disagreements over interpretation dominate the court’s public persona. However, “the justices maintain their relationships even as different cases pass,” Moore reveals.